Give yourself a wintry manicure with one of these stylish shades. During the winter, get inspired by the colors around you. We've collected icy, shimmery, winter-inspired nail polishes that embrace the season. Whether it's a winter wonderland or a dreary landscape outside, your nails can shimmer and shine. We've picked out 16 gleaming nail polish shades inspired by the season. Give yourself a gorgeous winter manicure. Glossy and pure white, Purity is a must-have for any polish collection. Use it for French tips or go with bold white nails. A frosty, pale silver metallic finish gives Seraphina the perfect icy look for winter. Full coverage makes this an easy polish to apply at home. Delicate and sheer, Ginessa is a pure white with delicate shimmers of silver. Try this one on your little girl's nails. Transform the look of any of your favorite pale colors with Mosheen, a special effect glitter topcoat. 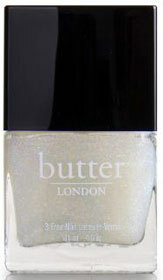 Despite the naughty name, Frilly Knickers is a sweet, super pale polish with a sheer finish. It adds dimension as a topcoat. 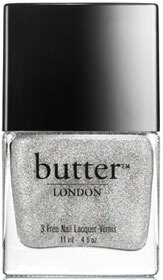 Wear Stardust, a holographic silver topcoat, alone on natural nails or over any color to add depth. Pure, opaque white goes wild with holographic rainbow sparkles in Peak of Chic, a playful winter shade. Super pale blue resembles ice and midnight snow in Borrowed & Blue. This is a solid everyday shade that's work friendly. If you're heading to a cocktail party this winter season, adorn your nails with Show Me the Ring, a perfect pearl shade. This pure white shade is a little bit sheer. Use Marshmallow for delicate French tips or wear alone for a classy white. Hyperactive, a special effects topcoat, transforms any polish color into an icy treat. Not quite matte but not creme either, Pseudo Silk Kimono resembles the texture of pure silk fabric. This sheer white is warmed with gold flecks. Ski Slope Sweetie will take you from day to night. Playful and pale, Whimsical is a sheer, cool white with fun flecks of holographic glitter. Snow Storm, a long-lasting polish in a cool, silver frost, wears well on winter days. Get super playful with Snow Globe, a super shiny white with colorful confetti that looks like the top of a sugar cookie.